Description A multi-language environment for both interactive data analysis and batch data processing. Computationally intensive disciplines such as computational biology often require use of a variety of tools implemented in different scripting languages and analysis of large data sets using high-performance computing systems. Although scientific workflow systems can powerfully organize and execute large-scale data-analysis processes, creating and maintaining such workflows usually comes with nontrivial learning curves and engineering overhead, making them cumbersome to use for everyday data exploration and prototyping. To address these problems, we developed Script of Scripts (SoS), an interactive data-analysis platform and workflow system with a strong emphasis on readability, practicality, and reproducibility in daily computational research. 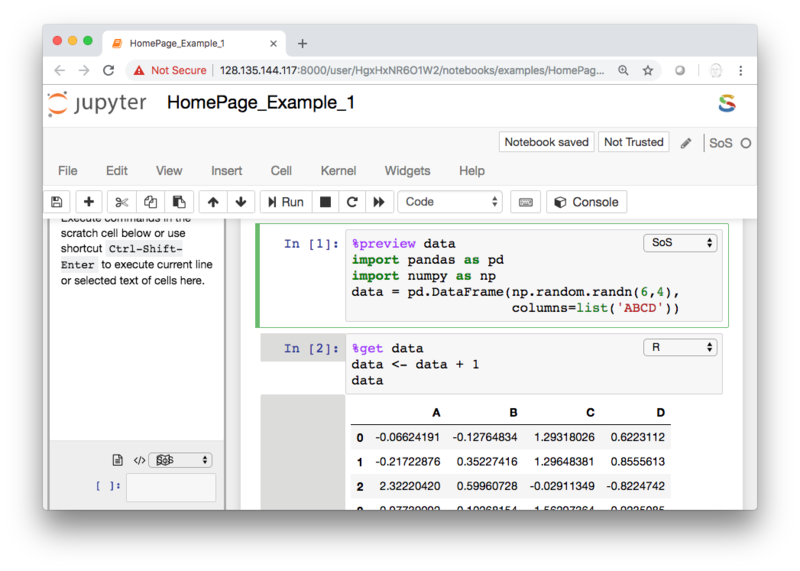 For exploratory analysis, SoS has a multilanguage scripting format that centralizes otherwise-scattered scripts and creates dynamic reports for publication and sharing. As a polyglot notebook, SoS provides a web-based notebook environment that allows the use of multiple scripting language in a single notebook, with data flowing freely within and across languages. As a workflow engine, SoS provides an intuitive syntax for creating workflows in process-oriented, outcome-oriented, and mixed styles, as well as a unified interface for executing and managing tasks on a variety of computing platforms with automatic synchronization of files among isolated file systems. As discussed in our publications, SoS is both an interactive analysis tool and pipeline platform suitable for different stages of method development and data-analysis projects. In particular, SoS can be easily adopted in existing data analysis routines to substantially improve organization, readability, and cross-platform computation management of research projects.